Today’s #VeteranOfTheDay is Marine Veteran Private 1st Class Pete Card. Pete Card joined the United States Marine Corps in 1956. He completed his basic training at Camp Pendleton and served two years at Twenty-nine Palms Marine Corps Base. When Pete became Private 1st Class, his mother had accidentally sewn his stripes on upside down on his uniform. Fortunately, Pete noticed before returning to his unit and the stripes were immediately put in their proper place. As the Card family has a long history of Military Service, including Pete’s Grandfather COL Lee Card who served in WWI, Pete’s brothers soon followed suit. His brother Dave Card joined the Air Force, Harry “Bill” Card served in the Army, and Jon Card served in the Navy. The family photo shows all the brothers in uniform with their parents and Pete’s sister, Ellen, who worked at El Camino Hospital. Pete is the father of two and the grandfather of many, with more to come. He resides in Santa Cruz, California with his wife, Michele. Today, he celebrates his 80th birthday! 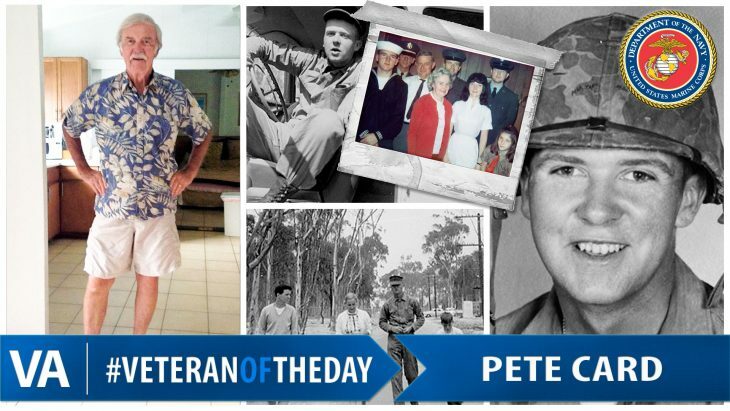 Thank you for your service, Pete!